New Egypt, NJ (April 21, 2019) – At New Egypt Speedway’s Plumsted Township Night, Matt Stangle scored a win in the Vahlco Wheels Modified feature. The Crate Modified feature was won by Eric Palmer. Rich Mellor collected the checkered flag in the main event for the Larry's Hot Rods & Harley's Northeast Wingless Sprint Cars. Joe Garey Sr. visited victory lane after winning the 4-Cylinder race while Anthony Tramontana Jr. was the victor in the Lyons Construction/Metal Fab Rookie Sportsman. The 30-lap Vahlco Wheels Modified feature began with polesitter Brian Papiez bolting to the front with JR Fulper and Matt Stangle in tow. The top three remained in order until a pair of cautions took place on the sixth tour. When green flag racing returned, Stangle grabbed the lead with Papiez in second and Fulper in third. Mike Butler, who started the event in fourteenth, was continuing his march forward as he moved into fourth place on the eighth revolution. After an eleventh lap yellow flag for a slowing John McClelland, the ensuing restart was red flagged as Kevin Vaclavicek’s car flipped on the frontstretch and collected other competitors. Once action resumed, Stangle was still on top with Papiez in second with twelve laps completed. 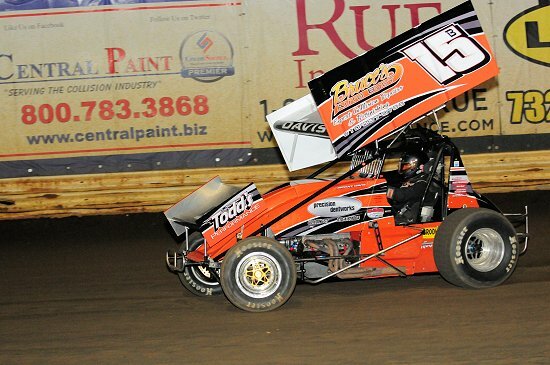 Sixteenth place starting Danny Bouc inched closer to the front as he passed Butler for third on the thirteenth tour. The yellow lights illuminated for the final time with eight laps to go for Fulper. As the green flag waved, Stangle held off Papiez to maintain his lead as Butler took third place from Bouc and eighteenth place starting Ryan Godown motoring into fifth. On the very next circuit, Bouc regained third from Butler. With five laps remaining, Stangle had developed a half straight away advantage over Papiez. Stangle went unchallenged the rest of the way to pick up his second career Modified feature win. Papiez’s strong run netted him the runner-up position. With Bouc finishing third, Butler was fourth and Godown was fifth. Brian Papiez, Matt Stangle and TJ Lilly claimed the Vahlco Modified heat races. 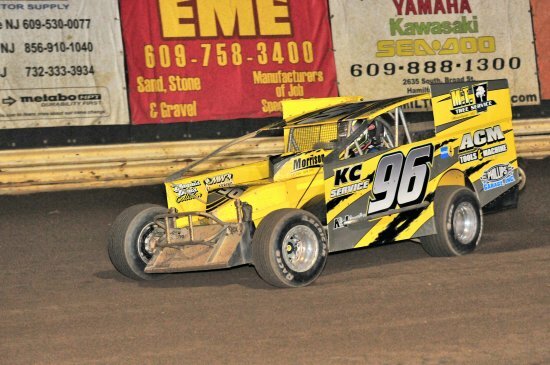 In the 20-lap Crate Modified feature, Eric Palmer catapulted to the front on the second circuit and remained on top to capture his ninth career victory. Second place went to Joseph Brown. George Gareis Jr. came from eighth place to finish in third. Ryan Heim and Aaron Weaver rounded out the top five. The Crate Modifieds heat races were won by Joseph Brown and Eric Palmer. Robby Dunn was the victor of the consolation contest. For the third time in his career, Rich Mellor took top honors in the 25-lap Larry's Hot Rods & Harley's Northeast Wingless Sprint Cars main event. Following a restart, Mellor overtook Brian Spencer on the sixteenth circuit and pulled away from the pack to gain the win. With Spencer taking second, Jermain Godshall was third. Heidi Hedin was fourth and Al Cheney came home in fifth. John Brammell and Brian Spencer took the Larry's Hot Rods & Harley's Northeast Wingless Sprint Cars qualifying events. After taking the lead from Paul Hartwig on the second circuit, Joe Garey Sr. went unchallenged to capture the 15-lap 4-Cylinder race. The runner-up spot was taken by Joe Garey Jr. Mike Fox was third. Fourth went to TJ Graves with Hartwig holding on to take fifth. Anthony Tramontana Jr. took the lead from Nick Van Wickle as the white flag waved to win his first career Lyons Construction/Metal Fab Rookie Sportsman contest. Ryan Godown Jr., who had won the first two rookie races this season, nipped Van Wickle at the line to grab second. With Van Wickle third, Ryan Krushinski was fourth and Vinny Troia was fifth. On Saturday, April 27 at New Egypt Speedway, Premio Sausage Night will present two 20-lap features for the Vahlco Modifieds. The Larry's Hot Rods & Harley's Northeast Wingless Sprint Cars, Hammer Sportsman, Street Stocks & Lyons Construction/Metal Fab Rookie Sportsman will be on the agenda as well. Competitors can begin to enter the pits at 3:00 p.m. with the spectator ticket window opening at 4:00 p.m. Hot laps get cranked up at 5:00 p.m. and the first green flag waves at 6:00 p.m. Admission to the grandstand is $25 for adults, $23 for seniors 65 and older, $15 for teens 12-15, $15 for military personal and their spouses with ID, and Kids 11 & under are FREE. Pit admission is $30 with a New Egypt Speedway license and $40 without. Heat 1 - 1. Brian Papiez 2. Mike Butler 3. John Pakenham 4. Blaine Bracelin 5. Billy Osmun 6. Billy Pauch Jr.
1. ERIC PALMER 2. Joseph Brown 3. George Gareis Jr. 4. Ryan Heim 5. Aaron Weaver 6. Dan Fleming 7. Ryan Simmons 8. Sammy Martz Jr. 9. Johnny Bangs 10. Glenn McIntyre 11. Jeremy Martino 12. Ryan Godown Jr. 13. Andy Walko 14. Matt Miller 15. Vinny Troia 16. Kevin Borden 17. Nick Van Wickle 18. Robby Dunn 19. Tom Princiotta 20. Bobby Holzwarth 21. Joe Toth 22. DJ Hunt 23. Steve Hicks 24. Rob Mancini 25. Anthony Tramontana Jr. In the 25-lap Larry's Hot Rods & Harley's Northeast Wingless Sprint Car main event, Jermain Godshall used the outside groove on the final tour to visit victory lane for the third time in his career. For the opening nine laps, Stan Ploski headed his rivals before Godshall took over. Rich Mellor gained the top spot from Godshall on the twelfth tour. Once in front, Mellor began to pull away and had his sizeable margin wiped out by a caution period on lap twenty-three. On the last revolution of the race, Mellor lost control of his car in the final corner and Godshall took advantage of the miscue to claim the win. Mellor was able to hold on for second and Ploski was third. Heidi Hedin and Duane Nixon filled out the top five. Ploski and Brad Schalle won the heat races. the Modified feature. Bob Lineman Jr. topped the field in the Crate vs.
top with Strunk, Danny Bouc, David VanHorn and Brett Kressley next in line. Strunk in tow while Bouc and VanHorn were in close quarters for third place. by JR Fulper stopped the action. 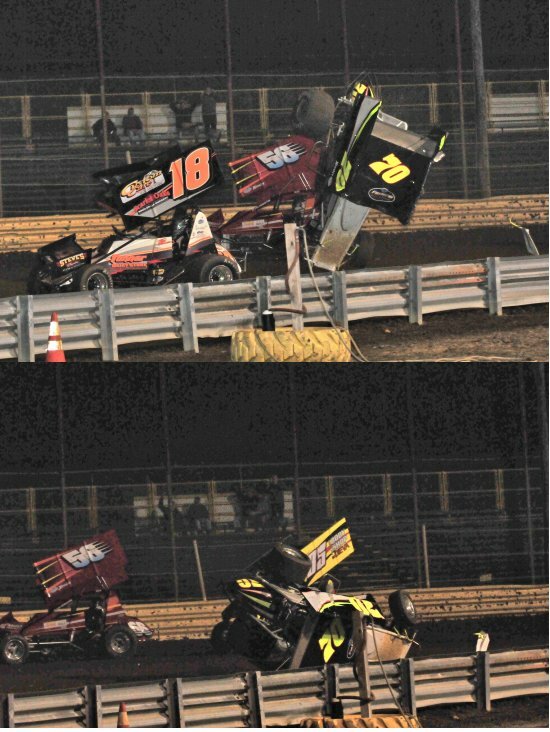 When green flag racing returned, Pauch Jr.
events went to Mike Gular and Brian Papiez. twentieth of his career. Cale Ross came from twelfth to finish in second. Ellery, Art Liedl and Will Dupree. Consolation 2 - 1. Brian Papiez 2. Wade Hendrickson 3. Dakota Kessler 4. 10. Ryan Krachun 11. Kevin Vaclavicek 12. Brian Krummel 13. Mike Butler 14. Heat 1 - 1. Matt Ellery 2. Brad Arnold 3. Cale Ross 4. Jeremy Martino 5. Heat 2 - 1. Art Liedl 2. Jim Housworth 3. Ryan Heim 4. Bob Lineman Jr. 5. Heat 3 - 1. Will Dupree 2. Jason Kosch 3. J.D. Cranstoun 4. Bill Liedtka 5. Sammy Martz Jr. 6. John Scarpati Jr.
Martino 6. J.D. Cranstoun 7. Brad Arnold 8. Jim Housworth 9. Jason Kosch 10. David Burns 11. Will Dupree 12. Brad Roberts 13. Pat Wall 14. Mike Toth 15.
be signing a specially created poster for this event during intermission. panels and all other Short Track Super Series South Rules will be in effect. exhibition event staged by the Garden State Vintage Stock Car Club. QUALIFIER for one of their sponsors (valid only toward a non-racing order). military personal and their spouses with ID, and kids 11 & under are free.